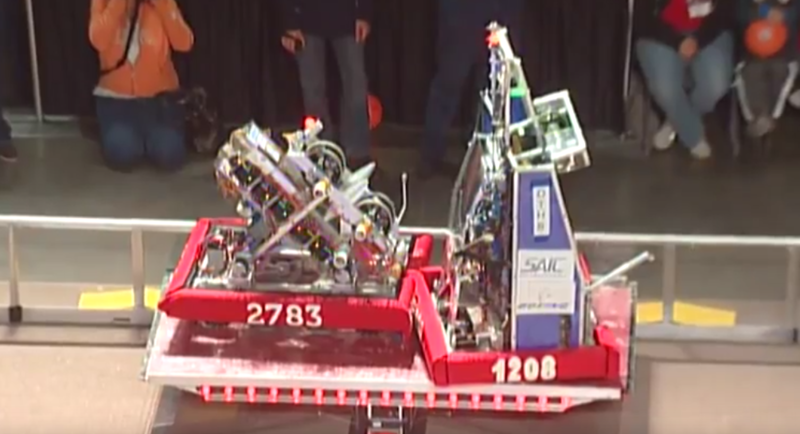 Engineers of Tomorrow (EOT) FRC 2783, is a FIRST Robotics Challenge(FRC) team. EOT is a high school community team with members from 4 counties. In 10 years, it has grown from 12 students to over 50. EOT has earned a spot at the World Championships 4 of the last 5 years, earning the Chairman’s Award, 2 Engineering Inspiration, Judge’s Award, Safety and Rookie All-Star. These are the top awards in FIRST. EOT has had 6 members receive top academic awards, 94% of alumni choose STEM Careers. EOT has founded and mentor 29 FIRST robotics teams. We demo and teach STEM year-round through our community at schools, libraries, children’s centers, Scout camps, KY State Fair and Maker’s Fairs. During the summer, EOT hosts over 150 students at our programming camps, adding more each year. EOT hosts training classes for safety, tools, build, coding, and CAD. We invite other teams, scout troops and local high school groups to take part. Our reputation is one of being a leader in STEM education. and maker’s faire with over 400,00 in attendance. We are grateful to our sponsors and display their logos proudly. We earn $14,000 from hosting summer STEM camps. We use these funds to give back to our community by funding STEM teams, scholarships to camps and supporting local charities. EOT has also supported children’s orphanages in Central America. The Engineers of Tomorrow will continue to work hard to increase the number of students we can educate. With having our equipment needs funded, we can better use our earned money to supply robots and laptops to inner-city centers. However, before we can help others, we must train the students on our team. Our mentors work hard at passing their knowledge to our students thus confirming our team ideals of ‘what you learn, you teach’. Our team logged over 8,000 hours in outreach last year and we will continue to strive to do more. Our program can be evaluated by the success of our team members individually, the success of our team at competitions and the students in our communities we inspire every year. FRC 2783: EOT has earned a spot at the World Championships 4 of the last 5 years, earning the top Chairman’s Award, 2 Engineering Inspiration Awards, Judge’s Award, top Safety awards every year and the Rookie All-Star. We average 15-20 new members a year. 25% female. Engineers of Tomorrow continues to improve and expand learning opportunites for not only our members but students in our communities. EOT never turns down an invitation to educate, demonstrate and inspire others.